As mentioned earlier this week, Tim and I had a super amazing meal of blackened tilapia oven panang curry quinoa with spinach last week. 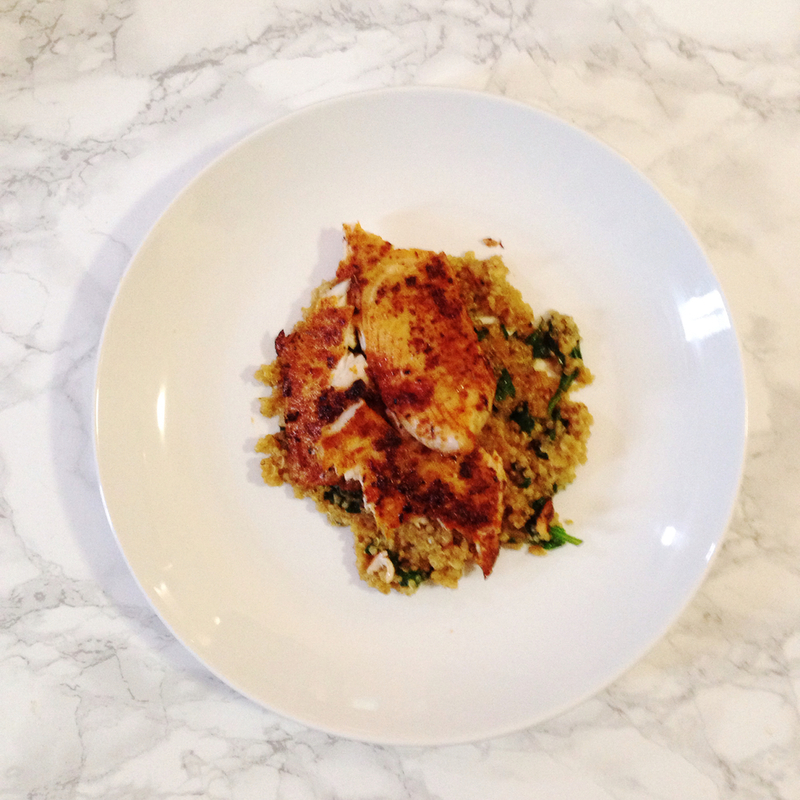 Since I've given you the recipe for the quinoa, I figured you should probably have the recipe for the tilapia too! Now, I should probably warn you, unless you like spicy food as much as I do, you may not want to have both of these dishes together like we did. The spice from the curry combined with the cayenne in the blackening seasoning definitely had a double-kick! But, that said, the flavors are pretty awesome together, so if you like spice, definitely try it. We had a ton of blackened fish in Barbados, so I was itching to make it on my own when we got home. For some reason, my local Whole Foods didn't have any pre-made blackening seasoning, so I turned to the ever-reliable internetz. I found this recipe from The Wicked Noodle and, since I already had all of the ingredients in my spice rack, I decided to give it a try. And boy, am I glad I did! I'm definitely going to steal her idea of packaging this stuff up in little jars as gifts - it's that good! All I did here was cover my tilapia fillets in olive oil, rub them with the seasoning, and pan-fry them in a cast iron skillet, and voila! An amazing, healthy meal ready to be repeated over and over and over again. You can also use this seasoning on whatever else you're craving - fish, shrimp, chicken... Yum! Mix all spices together. Rub each tilapia filet with 1 tablespoon of olive oil. Coat tilapia with seasoning. Heat remaining olive oil in skillet over medium heat. Add tilapia and let cook until you can start to see the fish turn opaque on the sides (3-4 minutes). Flip and cook until done, 3ish minutes. Finish with squeeze of lemon juice and serve!